The "Apollo 19 Balloon" envelope is in fact a giant bag made of very light, fragile, diaphanous polyethylene. Such a balloon is filled partially with helium and is subsequently launched in a particular way. Such an envelope can only be used once. For almost two years Fons has done a thorough investigation into the techniques, which could make possible the construction of a gigantic 500,000-m³ balloon. Primarily it was necessary to find polyethylene with excellent mechanical and thermal properties. Finding such a film proved to be difficult since 'brittleness point' is also a very important parameter. A Dutch polyethylene film producer and a Holland located division of an American supplier of raw material succeeded in producing the right special film. Almost 40,000 m² meters were extruded under tight control. The film proved to be three times stronger then other films. 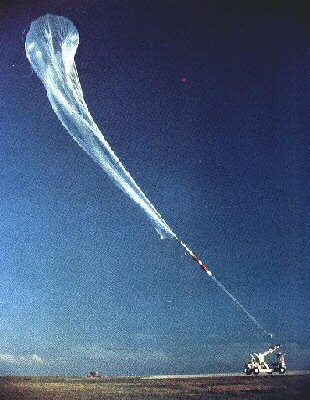 The execution of innumerable glue tests and the construction of several test balloons led to good results. The material used to weave the important envelope gores was supplied by the Dutch DSM High Performance Fibers Company. This firm produces 'Dyneema', the strongest fiber in the world. The fiber is very, very strong and has enormous thermal properties since there is no brittleness point found as low as -150°C. The free breaking length of the fiber is no less than 330 km. Dyneema would in theory reach to a satellite's orbit! Fons also built an apparatus to test the permeability of the folia for helium. Putting together the strokes of polyethylene gave the most problems with great dimensions. It had to be done very carefully because the sealing must not contain enclosed air-bubbles. The balloon is fitted with a valve, which enables the escape of helium. This makes it possible to land in a controlled manner. At take-off, the bag will be filled with approximately 1,700 m³ of helium. 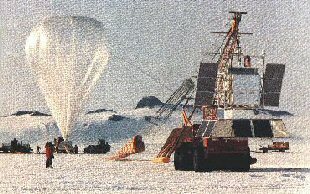 The launching of a "scientific balloon", such as the "Apollo 19 Balloon" can in no way be compared with the ascent of a classic hot-air balloon. The balloonists are also unable to take part in the launch because they have to take their place in the gondola at an early stage. The laying of the "envelope" with great care at the "launch site", the filling of the balloon with helium gas, the control of all connections, and the releasing of the balloon and gondola, has to be executed by a "special crew".